“Hubble’s Amazing Rescue” is a wonderful new film produced for the NOVA television science series documenting the compelling story of the mission to save the Hubble Space Telescope (HST). 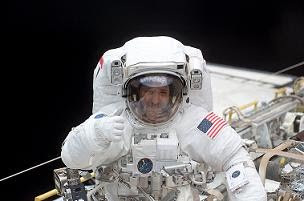 The film presents an insider’s perspective of the May 2009 rescue mission starting a full two years leading up to launch all the way to the dangerous 12-day mission and its five pressure-filled spacewalks. The Space Shuttle Atlantis crew travelled 5,276,000 miles in 197 Earth orbits during the mission. Filmmaker Rushmore DeNooyer crafts a fascinating story of scientific intrigue. After nearly 20 years in space and hundreds of thousands of spectacular images, HST’s gyroscopes and sensors were failing, its batteries running down, and some of its instruments were already dead. The only hope to save Hubble was a mission so dangerous that in 2004 NASA cancelled it because it was considered too risky. But after persistent urging by scientists and the general public, NASA revived the mission. This story of the final Hubble repair mission and the end of space shuttle missions is one of human fortitude in the search for nature’s secrets. After witnessing a very successful repair mission, the viewer is excited about new images, information, and insights that will emerge from the powerful upgrades to the world-famous telescope. The Physics Groupie previewed the film prior to its premiere Tuesday, October 13 on PBS. It is a tantalizing tale that will excite any Science Lifestyler with a sense of adventure in pursuit of scientific discovery. I wanted to stand up and cheer at the completion of the film, the significance to human scientific progress is that profound. I highly recommend viewing the film for an enjoyable family science evening at home. In preparation for the film, it would be fun to have the kids build a “hand-held Hubble” scale model of HST. The Hubble should be part of every family!